The Farmers Market at Hershey started up a few weeks ago. We have been vendors there for years, and enjoy all there is to this market. The patrons, other vendors, the venue: it is lovely. Each year there are a few changes to vendors (this year there is a goat cheese vendor weekly, last year a different farmer was there every other week with goat cheese) and to the structure. Years ago we each had to bring our own umbrella or easy up. Now there are large, beautiful white tents and we are all under the same cover. The locations of each vendor will vary slightly from year to year. A new vendor joined us this year. They bring their kids along, there seem to be many of them of assorted ages. 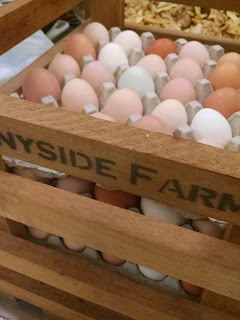 When I set up my table I put out one dozen eggs while keeping the rest in a cooler. Two little girls from the new vendors family stopped in front of the open carton of eggs. With eyes about level with the eggs, they stood and spoke to each other about the dozen before them. After length discussion they began a conversation with me. Their questions were about the breeds of chickens we raise, production level, if feed makes a difference: all reasonable, thoughtful questions. They pointed at specific eggs, described what type of eggs they have on their farm, the size of their flock, why and when they need to replace their hens... conversations I usually have with other farmers. Usually other farmers that don't have a mouthful of baby teeth, but conversation topics I have all the time. 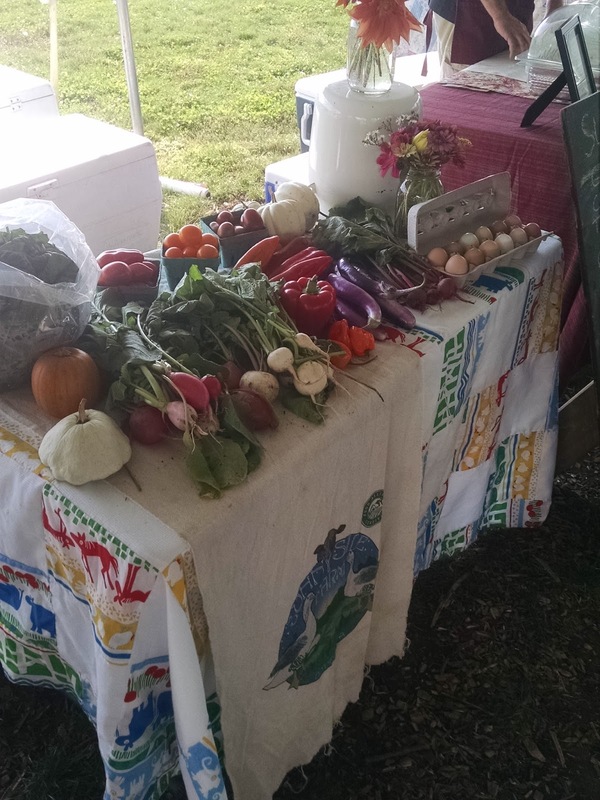 When they walked away (they had begun the conversation with informing me they are farmers, and would not be purchasing, just chatting) the vendor next to me (not a farmer) was busting to talk about our exchange. "Did you just have a full on agricultural conversation with those two little girls?!" "They knew their breeds of hens, production level, lifetime of birds, housing, predators?!" Not once did these two girls try and poke or touch the eggs. They did not lean on or erase the chalkboard. They were respectful in every possible way. Even the farm kids I know who swear up a storm are just like this. They do enough work with their hands and minds daily that they are not restless. They know textures. They know a gentle, soft touch, a firm strong touch, how to hold an animal to keep both human and animal safe. They are fearless of dirt and of injury. Calm in what make adults hysterical. Understanding of how reproduction, birth defects, death, decisions that are necessary for medical care, treatment, administration of medications. Clear-headed and thoughtful and measured as a result. To me it was just what I expect from little kids raised on a farm. The first time a 9 year old kid showed me their book filled with costs, expenses, profits and losses on his egg layer flock I was surprised. His records went back for years, and his writing and math skills had improved over the years of keeping his journal. Meeting young kids still with only baby teeth who can participate in this type of exchange no longer surprises me. The original entrepreneur, with little fanfare, IPO or wall Street journal coverage?